This past Wednesday, the 5th of July, Congressional Republicans held public hearings on the east and west coasts concerning the illegal immigration problem this country is currently mired in. Most attendees felt the hearings were nothing more than a dog and pony show designed to generate political support towards election season. This is probably true. Still, it’s always interesting to hear public officials spew forth their opinions, especially over such a politically divisive issue as illegal immigration. Our very own Los Angeles County Sheriff, Lee Baca testified at the west coast meeting held in San Diego. If this man has done little to fight crime in the years he’s been sheriff, he certainly demonstrated his lack of will to deal with the illegals in LA county or to discourage employers who hire illegal aliens, despite the fact he readily admits that the Los Angeles area hosts more illegals than any other region in the United States. At the house committee hearing, Baca made the outrageous claim that illegals provide a service to the country, and should they be deported, and those employers jailed, the economy would suffer greatly. Wow. I didn’t know Sheriff Lee Baca was an economist, but apparently he’s changed careers. He’s already kicking it off to a bad start if so. First of all, no one is proposing that employers who knowingly hire illegals be incarcerated for that infraction. Fine them heavily, and expunge their workforce of the illegal workers. Do that to enough shady employers and I guarantee countless more will spook to the point of firing their undesirable staff. Selective deportation is a proven tactic. It’s been done many times, and it’s worked. Many illegals do become frightened and leave the country, if only temporarily. This of course brings up the need for more dependable border security. We need stronger borders. We need to enforce our borders. We need to maintain a border vigil electronically and physically because right now our southern border is so porous as to allow a convoy of MX missiles to cross with nary a pair of eyes in hundreds of miles to even take notice. While I am clearly exaggerating, don’t think something to this effect couldn’t happen on a smaller scale with devastating results. There are countless human traffickers who will smuggle anyone across the Mexican border as long as they get paid to do it. Not only will they transport people, but anything, any item one has the desire to move into the U.S. 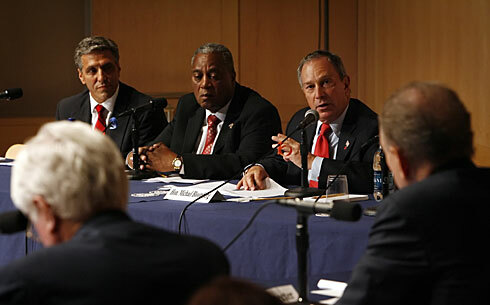 Apparently New York City Mayor, Michael Bloomberg has forgotten 9/11 and/or he doesn’t care, as is apparent from defeatist statements concerning the tide of illegal immigration he made at the east coast hearings held in Philadelphia, PA (story below.) This is especially timely today considering the FBI made public a plot to blow up the Holland tunnel in New York. Bloomberg’s comments were similar to those made by Baca in San Diego–economic doom and gloom. If anything, the recent “Day Without an Immigrant” demonstrated the only communities that were significantly harmed by that boycott were high Latino populated regions and businesses. Other economic damage was negligible if even noticeable–Los Angeles was not shut down, and the country is still here. The idea that our nation would be damaged and thrown into economic turmoil is preposterous. All a “Day Without an Immigrant” accomplished was to confirmed that the country would still function normally without illegal labor. But then again, I’m not an economist like Sheriff Baca. I am all for the House enforcement bill. I am wholly against the Senate “Path to Citizenship” bill (Amnesty by any other name.) Border enforcement must come first for many reasons before we can even think to consider granting citizenship to a swath of people have no concerns for even minimal assimilation, who willingly break our laws on a daily basis, who put stress on school systems that were struggling to begin with, and who chip away at our health care system while offering nothing in return but cheap labor to unscrupulous employers who have no desire to pay a fair wage to American citizens, no matter their ethnicity. SAN DIEGO Congressional Republicans heard lively testimony Wednesday from mayors, sheriffs and ordinary citizens in two public hearings held on both coasts to discuss illegal immigration. The hearings in San Diego and Philadelphia marked the opening of a summer season that will take proponents of competing immigration proposals in Congress across the country. The aim is to demonstrate public support for their plans. The House bill focuses on enforcing the border and cracking down on companies that hire illegal immigrants. The House version does not include the proposal of the Senate bill to create a path to citizenship for most of the estimated 12 million people living here illegally. On the West Coast, much of the talk was about how hard it is to handle the stream of Mexican citizens coming across the border. “It is elementary: To defend ourselves, we must secure our borders,” Royce said. Law enforcement officials testified that a large number of criminals were slipping across the border. Los Angeles County Sheriff Lee Baca said 27f the inmates in his jails are illegal immigrants. Rick Flores, sheriff of Webb County, Texas, says his department duels with drug cartels and smuggling operations across the border in Nuevo Laredo, Mexico. Darryl Griffen, chief of the San Diego sector of the U.S. Border Patrol, said he needs not just more officers but better technology to stop illegal entrants. He said electronic monitoring equipment that assists officers covers 9 miles of the 60 miles of border for which he is responsible. “They’re turning our country into their country,” said Dan Colandria, 34, of Vista, Calif.
Colandria said he is a member of the Minutemen, a volunteer group that patrols the border with Mexico and calls authorities when people are spotted trying to sneak across. “It’s just not right,” he said. Democrats mocked the Republicans for holding hearings they said would not lead to solutions. “These hearings are not designed to legislate they are designed to whip up public opinion,” said Rep. Brad Sherman, D-Calif.
New York City Mayor Michael Bloomberg, a Republican, urged lawmakers to find a way to let illegal immigrants remain in the country. He told the panel in Philadelphia that New York City is home to more than 3 million immigrants and a half-million of them came here illegally. Philadelphia Police Commissioner Sylvester Johnson and representatives of Pennsylvania’s dairy, landscaping and hospitality industries testified in favor of giving illegal immigrants a chance at citizenship. Louis Barletta, the Republican mayor of Hazleton, a northeast Pennsylvania town of 22,000 people, said his city has been “terrorized” by illegal immigrant drug dealers and murderers. He said he is pushing an ordinance that will impose tough penalties on employers who hire illegal immigrants. IF THE government expects beefed-up border patrols to stop undocumented workers from pouring into this country, “you might as well sit on the beach and tell the tide not to come in,” New York City Mayor Michael Bloomberg told the U.S. Senate Judiciary Committee’s immigration-reform hearings here yesterday. Instead of “winking at businesses that hired illegal immigrants,” Bloomberg said, the government should require all workers to carry “biometric” Social Security cards that use DNA or fingerprint ID – and require employers to check the cards against a national database. Bloomberg and Philadelphia Police Commissioner Sylvester Johnson agreed that it is not the job of city cops to enforce federal immigration laws. The commissioner said that enforcing federal immigration laws would destroy the positive relationship between police and the immigrant community that is vital to gathering intelligence for his department’s primary mission – fighting crime. Both Johnson and Bloomberg testified that city police departments are legally mandated to spend their budgets on public safety, not on immigration investigations, but Hazleton Mayor Louis Barletta strongly disagreed. Barletta recently attracted national attention by championing an “illegal-immigration-relief” ordinance, effective July 13, that will effectively shut down for five years any Hazleton business caught hiring “illegal aliens” and any landlord caught renting or leasing to them. Barletta did not offer any statistical evidence to support those claims yesterday. He told the Daily News that he did not know how many “illegal aliens” lived or worked or went to school or committed crimes in Hazleton. Barletta repeatedly cited three recent crimes in Hazleton – a murder, a playground shooting and a crack-cocaine operation – that involved illegal immigrants. But he could not say how many Hazleton crimes had been committed by “illegal immigrants” and how many by legal residents. He said that his small-town budget was “buckling under the strain of illegal immigrants” but that he did not know how many undocumented workers contributed to the city’s budget by paying taxes. Bloomberg, on the other hand, said that 75 percent of New York City’s 500,000 undocumented workers paid their taxes and that the city’s tax base and its economy would be “decimated” without their contributions. Bloomberg said that instead of talking about deporting the nation’s estimated 11 million to 12 million illegal immigrants – who have violated civil, not criminal, laws – as felons, the country should give them the chance to earn permanent residency and remain united with their families here. Ricardo Diaz, of the Day Without an Immigrant Coalition, led a small group of protesters who demonstrated peacefully outside the National Constitution Center. The protest was small, he said, because the hearings were a “dog-and-pony show,” rather than a congressional debate, and were not worth asking immigrants to miss a day of work for – “What was I going to do with 10,000 people here?” he asked. “That’s not dialogue,” Diaz said of the divide between the big-city and small-city mayors. “It’s time for [anti-immigration congressmen] to put their Goliath against our David, and let’s do it. The first in a series of congressional hearings on immigration reform was held Wednesday at the Imperial Beach Border Patrol Station, where a number of officials weighed in on the divisive issue. The packed hearing is one of several organized nationwide by Republican congressional leaders, who pledged to hold such sessions before negotiating a compromise immigration bill with the Senate. The Senate plan would beef up border enforcement, offer a path to legalization to millions of undocumented migrants and create a guest worker program, while the House plan focuses on border and interior enforcement. Rep. Ed Royce, R-Fullerton, who chairs the House subcommittee, said the Border Patrol’s budget has increased 64 percent since 2000, but the federal government needs to do a better job securing the border. “More needs to be done since there is chaos in many (Border Patrol) sectors and the border is still very porous,” Royce said. Rep. Bob Filner, D-Chula Vista, apologized to Border Patrol officials who were called as witnesses at the hearing, saying they were part of a “huge cover-up” in Washington, D.C., because the borders have gone unprotected. Filner said no Republicans have consulted him on border issues, even though his district runs along the border from San Diego to Yuma, Ariz.
Nine Republican and six Democratic Congressional representatives attended the hearing. Darryl Griffen, chief of the San Diego Border Patrol sector, testified that his agents have apprehended about 108,000 illegal immigrants this year. He said the recent deployment of California National Guard troops will “very much so” help in patrolling the U.S. and Mexico border. Griffen said his biggest needs are remote video surveillance equipment and technology that can detect border tunnels. Corrupt agents are also a problem. U.S. Border Patrol agents suspected of smuggling drugs and humans into the United States were in hiding today after they apparently were tipped off about the probe, it was reported. Brothers Fidel and Raul Villarreal, who quit their Border Patrol jobs abruptly last month when they found out they were being investigated for aiding smugglers, may have fled to Mexico. A little more than a month ago, two customs officers at San Diego border crossings were charged with waving cars loaded with illegal immigrants in exchange for cash. In January, Oscar Antonio Ortiz, an illegal immigrant from Mexico who got a job as a Border Patrol agent, pleaded guilty to conspiring to smuggle people into the United States. Los Angeles County Sheriff Lee Baca told the panel that 26 percent of his jail population is composed of illegal immigrants. Housing illegal immigrants in Los Angeles County jails costs about $80 million per year, he said. Last year, the county was reimbursed $11 million by the federal government, he said. Los Angeles County Supervisor Mike Antonovich, a Republican, reeled off a list of taxpayer-borne costs associated with illegal immigration. “Our health care delivery system has become the HMO for the world,” he said. He said one of every 15 people in California was in the country illegally and suggested that the U.S. set up medical clinics in Mexico to stem the northward flow. About 50 people against the House’s proposal for immigration reform protested at the entrance to the meeting site. Pastor Art Cribbs, with the Christian Fellowship United Church of San Diego, called the meeting a “sham,” contending that not all the sides were heard.